Few names represent contemporary high fashion quite as well as Balenciaga. Even though the brand has been established since the early 20th century, it has redefined itself with various features and remained both current and favored. The Balenciaga motorcycle bags are the best example of new pieces that have become a cornerstone of the brand. Christobal Balenciaga was born in 1895 in the Basque region of Spain. From a very early age Christobal became acquainted with sewing by his mother. He took an immediate interest in tailoring and creating high fashion clothing, and quickly made himself known by the who’s-who in high society. Christobal Balenciaga as a young man. With his familiarity in fashion, Christobal met Marquesa de Casa Torres who could boost his popularity outside of his small fishing village. The wealthy Torres introduced Balenciaga to London and Parisian styles and favored him for an internship with dress-making and tailoring. Balenciaga became one of the most well-known courturier; meaning he could not only design a garment, but actually cut and sew the piece into existence. Shortley after his internship, in 1924, Balenciaga opened his first store named Eisa in San Sebastian. After growing to include two other stores in Madrid and Barcelona, Balenciaga hit a serious roadblock in the form of the Spanish Civil War in 1936-1937. With the turmoil, Balenciaga was forced to close his three stores in Spain. Following in the footsteps of some of his favorite designers, Christobal Balenciaga relocated his growing fashion house to the fashion capital: Paris, France. He opened his first store in Paris on Avenue George V in 1937 and immediately featured a couture collection that was met with great success. First Balenciaga Store Paris, France. Balenciaga’s initial and primary concentration was on haute couture fashion, and he did exceedingly well within this market. His creations were predominantly inspired by his Spanish culture and were deemed revolutionary in Paris. Even with the onset of the World Wars, Balenciaga’s client would brave the potentially perilous commute to Paris for his trend-setting creations. Throughout the mid 1900’s, Christobal Balenciaga remained a fashion force. From transforming the female silhouette with his designs to inspiring young up-and-coming designers such as Hubert de Givenchy and Oscar de la Renta. Balenciaga passed away in 1972, but his fashion line has not only persevered but has progressed. The Balenciaga brand has continued to flourish under various head’s of design. But it wasn’t until 1997 that the very young Nicolas Ghesquière assumed the helm. Ghesquière remained creative director for 15 years in which he produced the renowned and celebrated line of motorcycle-inspired handbags that sustains the Balenciaga brand today. Nicolas Ghesquière, Balenciaga Creative Director from 1997 to 2012. Unlike other esteemed handbags, Balenciaga bags were not created by the brand founder, Cristobal Balenciaga, and are not what you could call vintage. The first Balenciaga handbag debuted in 2000 as a runway accessory and the brainchild of Nicolas Ghesquière. Ghesquière originally designed the large handbag at the request of the top management of the Balenciaga organization. But they dismissed the finished product because it did not emulate typical Balenciaga style. But the bag found demand when it was least expected. Instead of remaining a runway accessory, Balenciaga models such as Kate Moss made this bag a staple off the runway. The Motorcycle Bag contradicts most other handbags in that it is soft and pliable and also lacks upright structure. The original Balenciaga bags were constructed out of thin and smooth chevre leather. This type of goat skin is extremely soft and resistant to normal wear and scratches. Many Balenciaga bags are now made out of agnea leather which is an equally soft and resilient lamb skin. While there are numerous styles and colors of the motorcycle bag, there are a couple of features that are standard. In stark contrast to the petite Chanel 2.55 bag, Balenciaga bags are large, over-sized purses. Typical embellishments consist of leather tassels, silver studs, and buckles. Most motorcycle bags with the exclusion of the envelope bags have leather rolled handles and shoulder straps that are optional. The history of the Balenciaga mortocycle bags may not be as enduring as rival brands such as Louis Vuitton, Chanel, and Hermes, but that doesn’t make the handbags worth any less. Following suit of the Balenciaga name, these purses represent affluence and style. To mirror your favorite celebrity candidly caught carrying a Balenciaga be prepared to spend a couple of thousand US dollars. The classic City and First bags start around $1,600.00 USD and can go over $2,000.00 USD. You can find these bags online, or in one of over 100 stores worldwide. 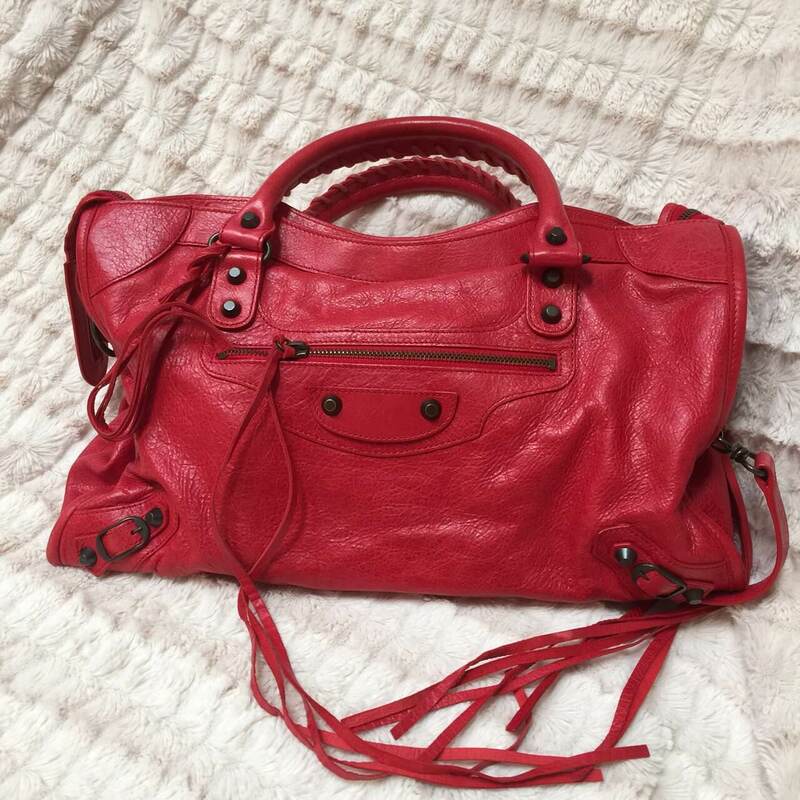 Fortunately, on reatil websites like Ebay and Tradesy you can find lightly used Balenciaga bags starting at a couple of hundred US dollars. Balenciaga will repair all the hardware on your handbags at no charge. You drop it off at your nearest boutique, and pick it up when ready! Like all leather goods, the wear and tear on the leather is excluded from repair. For leather stain removal, refinish or repair, check out our handbag and purse repair page. Balenciaga designed the air hostess (also know as flight attendant) uniforms for Air France, in 1968.